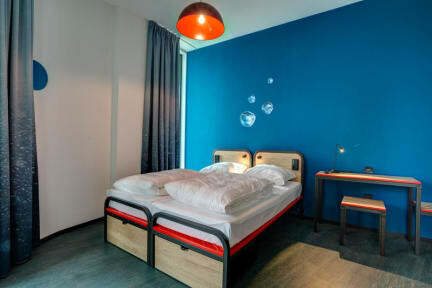 Our second MEININGER hotel in Amsterdam is located in the district of Watergraafsmeer in the immediate vicinity of Park Frankendael and Amsterdam's lifeline, the Amstel. It is also part of the city's tallest residential skyscraper and is located directly opposite the Amsterdam Amstelstation train station. Thanks to this location, the center with its sights is only a few minutes away by train. Alternatively, the historic old town can be easily reached by bike, crossing Berlagebrug, in just 15 minutes. The new hotel has 185 rooms in the modern MEININGER standard. All rooms, whether double, multiple or dorm, are equipped with a flatscreen TV, free Wi-Fi, hairdryer and private bathroom. 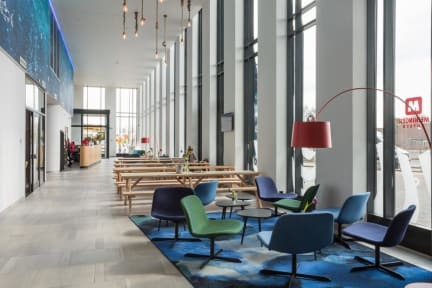 The rooms but also the public areas such as the reception, lobby, lounge, breakfast room and bar, as well as the MEININGER typical guest kitchen, Gamezone and Kidszone use the theme 'Sea Level', which is reflected in the design. So it does not stop you from trying in an authentic atmosphere in the guest kitchen to prepare Dutch specialties like 'Bitterballen' yourself! Or if you're more into dining out, relax in the lobby and check out the internet for Amsterdam's best restaurants. Free Wi-Fi is provided free of charge in all public areas and rooms. Our young, multilingual team is there for you 24 hours a day. We are looking forward to meeting you. Payment upon arrival by cash, VISA, MASTER, EC, Maestro, transfer. 0 to 7 days prior to arrival or in case of No Show we will charge you 100 % of the total booking amount. We require payment in advance for the whole booking amount (bank transfer or credit card payment), in order to guarantee your reservation. In case of cancellation from 0-6 days prior arrival we do also charge the credit card with 100 % of the whole amount. The credit card will be charged 6 prior arrival and the amount is not refundable. If payment is not received your booking will be cancelled. Очень чисто и опрятно. Особенно для хостела - супер! Мы даже не ожидали такого уровня и были приятно удивлены. Один раз у нас в номере погас свет, но на ресепшене нам сразу помогли и минут через 10 проблема была устранена. Так что остались только положительные эмоции!